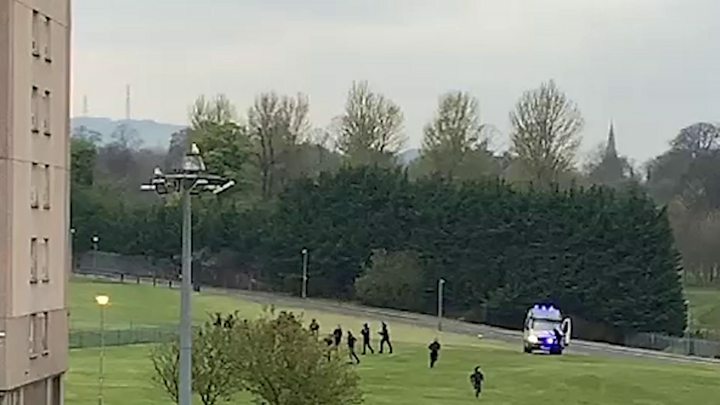 A teenage boy who was hit by a police van during a mass brawl in the south of Edinburgh has been arrested. The 16-year-old, who police say did not need medical treatment, was arrested for an alleged breach of the peace and an outstanding warrant. Officers were called to the disturbance on grassland near Moredunvale Park, Moredun at about 18:30 on Monday. It is thought about 30 youths were involved. The full circumstances regarding the collision are being investigated. Inquiries are ongoing to establish the identity of other youths who made off after officers arrived at the scene. Supt Mandy Paterson, from Police Scotland's Edinburgh Division, said: "From around 18:30 on Monday 15 April, officers in the South East received numerous calls relating to youth disorder and antisocial behaviour within the Moredunvale Park area. "Police were quickly dispatched and on arrival, the youths made off. Whilst in attendance, a 16 year-old male youth was arrested for a breach of the peace and outstanding warrant. "We have confirmed this person collided with a police vehicle immediately prior to his arrest. He did not require medical attention as a result of this. "The full circumstances of this collision are being investigated and the Police Scotland Professional Standards Unit have been informed. "We are committed to tackling antisocial behaviour and disorder across the city."